Jerry Seinfeld had the right idea when he said this quote. 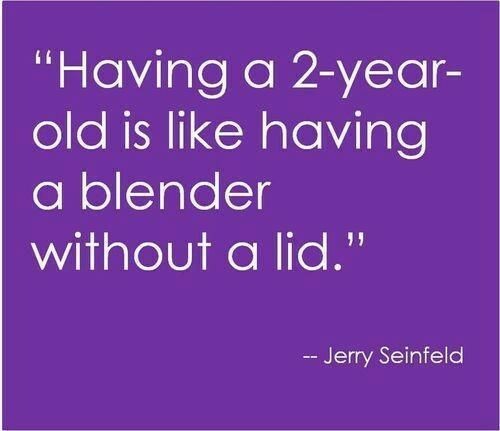 I would change one tiny little element though….I would say that any toddler who can walk and get into anything at all is like having a blender without a lid. Jaden is a blender with no lid…he plays strong and hard all day, well till midday when sleep time comes and then plays hard till bed time. I have often wondered since having children why God did not install a sleep button in our children. It can be incredibly difficult sometimes when your dealing with a toddler with a will just as strong as yours. It doesn’t seem fair that a grown adult has to fight their toddler to get them into their car safety seat. It really can be difficult some afternoons when he clearly does not want to be in the car, as he is so quick to get out of that belt. We have discovered that we must bring some type of cookie to help get him into the seat. I only breathe once I have that ‘Houdini stop’ buckled up! The Houdini Stop is my friend at the moment, before the Houdini stop I was pulling over on the side of the road, putting Jaden’s arms back into his belt and hopping back into the car… many times he would have his arms out of his belt by the time I got back into my seat and had buckled up. As you can imagine, on these days I would find myself much less calm, so when I found the Houdini Stop – it truly was my answer to prayer. Thank God for the Houdini Stop!!!! !